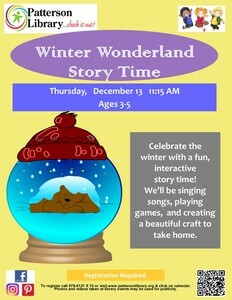 Celebrate the winter with a fun, interactive story time! We’ll be singing songs, playing games, and creating a beautiful craft to take home. For ages 3 – 5. For more information or to register contact the Patterson Library at 845-878-6121 x10 or go to www.pattersonlibrary.org and click Calendar.